Archaeologists in Madrid study remains buried under the Convent of the Barefoot Trinitarians on Jan. 24. 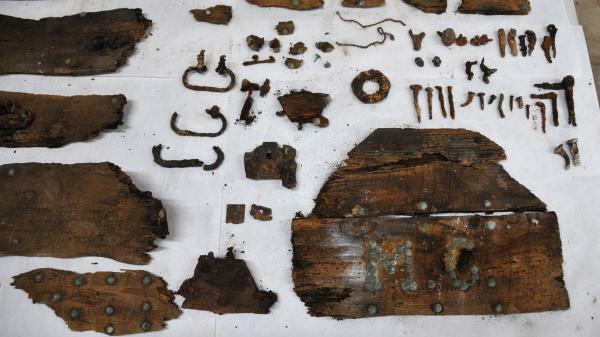 Tests proved the remains belonged to Miguel de Cervantes, the author of Don Quixote. Cervantes wanted to be buried at the convent because the nuns raised money and paid a ransom for his release when he was a young man held captive in North Africa. 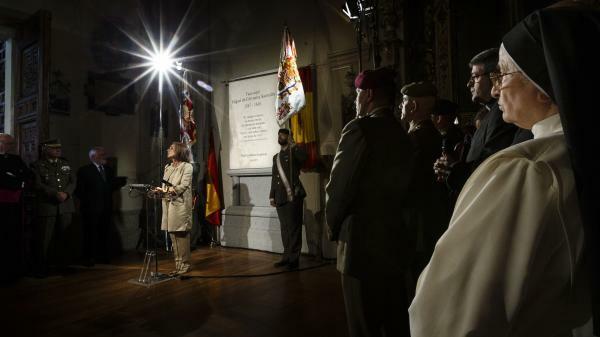 Madrid's outgoing mayor, Ana Botella, speaks during a June 11 ceremony unveiling a funeral monument holding the remains of Spanish writer Miguel de Cervantes in Madrid, on June 11. The formal burial comes nearly 400 years after his death. The initials "M.C" are on a wooden plank of an otherwise unidentified coffin in the crypt beneath the Convent of the Barefoot Trinitarians in Madrid. Testing proved that the remains belonged to Spanish writer Miguel de Cervantes, who died in 1616. It was Miguel de Cervantes' dying wish to be buried inside the walls of Madrid's Convento de las Trinitarias Descalzas — the Convent of the Barefoot Trinitarians — where a dozen cloistered nuns still live today, nearly 400 years later. Cervantes, born in 1547, is the most famous writer in the Spanish language. But the world would never have read his literature if it weren't for the Trinitarian nuns. Cervantes believed he owed his life to them. That's because before Cervantes wrote his two-volume masterpiece, The Ingenious Gentleman Don Quixote of La Mancha, the author had some chivalrous adventures of his own. And it was only then that he got kidnapped by Algerian pirates. "He was taken prisoner. He spent five years — five terrible years — as a slave, as a captive," says historian Fernando del Prado, who has devoted his life to studying Cervantes. With Cervantes enslaved in Africa, his family appealed to the Trinitarian nuns. They managed to raise a ransom and deliver it to the pirates — which won Cervantes his freedom. The fledgling author returned to Spain, and prayed at the Trinitarians' convent. He worked variously as a civil servant and a banker and eventually wrote Don Quixote, now recognized as the world's first modern novel. The epic novel tells the tale of a gentleman with romantic ideas and bumbling adventures across Spain's La Mancha plains. Over the past year and a half, Madrid has embarked on a quixotic mission of its own, locating Cervantes' bones under the Trinitarians' convent, and finally marking them with a gravestone. In an underground crypt, geophysicists used georadar to map the contours of long-forgotten burial chambers. "It's a magnetic impulse, like an X-ray," says Luis Avial, the technical director of Falcon High Tech, a geophysics company hired by the city of Madrid. "We put this strong signal in the ground, and what came back was the contours of all the cavities, structures and graves underneath. We were able to see it all." Once Avial and his team of geophysicists were able to see that there were indeed graves under the convent — as legend has long held — they turned the operation over to archaeologists and forensic anthropologists, who began excavations. "The only problem was the people who live in the convent. We needed to be very careful not to disturb the nuns living there in silence," Avial says. "But the technology — it isn't difficult." After digging for weeks, archaeologists found the bones of at least 15 people — men, women and children. They're believed to be anonymous faithful interred under the convent, over the centuries. But one set of bones was found inside the remnants of a splintered wooden coffin etched with the initials "M.C." The skeleton's ribs were flayed from bullet wounds — and its left arm crippled. Telltale signs, even before DNA testing, that the archaeologists had found their man. "When I saw that rib — I thought, 'We've found Cervantes at last! '," says Francisco Exteberría, a Spanish forensic anthropologist who famously exhumed the body of the Chilean poet Pablo Neruda in 2013. "It was a special moment," he says, recalling how he came across Cervantes' bones. "The whole team was there in silence, underground, studying what we found — and we all knew." 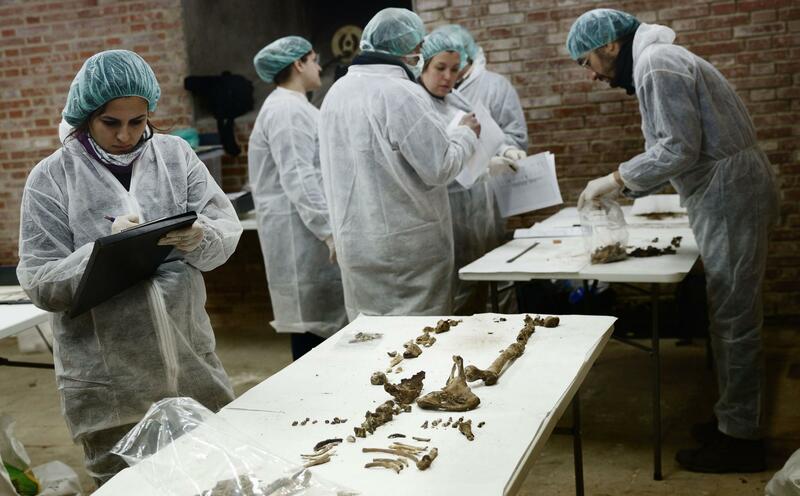 Earlier this month, Exteberría's team reburied Cervantes' bones near where they found them — adhering to the author's dying wish — and dedicated a monument to him upstairs, in the convent. Soldiers stood at attention and saluted the monument, as a military band played solemn music that reverberated through the convent. It was the same Spanish military unit Cervantes once served in. Even the nuns came out from behind their dark screen, where they're normally cloistered upstairs, to celebrate. "It was like a rescue," said Mother Superior Sor Amada de Jesus, giggling to reporters. She played down suggestions the excavations must have been noisy for nuns in prayer. "They were pretty discreet," she said of the workmen. "With emotion, it's time to say, 'Don Miguel, mission accomplished,' " Botella told a crowd. Cervantes died within a day of William Shakespeare, 400 years ago next year. Madrid officials are negotiating with the Trinitarian nuns over new visiting hours for their convent. For now, tourists can pay homage to Cervantes only during daily Mass. 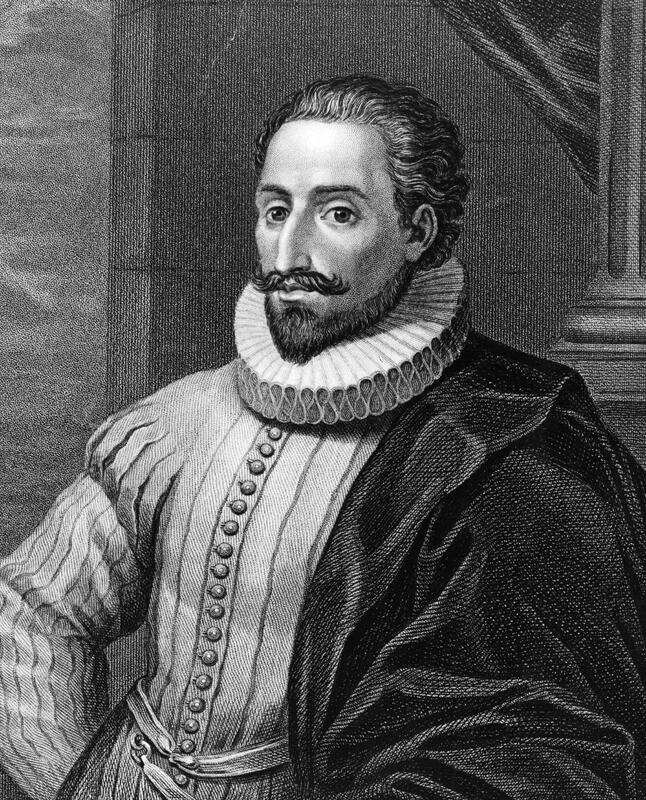 The literary legacy of Miguel de Cervantes has survived for 400 years. His novel "Don Quixote" is considered the greatest novel in the Spanish language, and millions who have not read the book know it through the musical "Man of La Mancha." But Cervantes himself, his physical remains, were lost until now. Legend had it he was buried under a Madrid convent, but he never got a gravestone. Lauren Frayer picks up the story from there. LAUREN FRAYER, BYLINE: It was Miguel de Cervantes dying wish to be buried here inside the walls of the Convent of the Barefoot Trinitarians, where a dozen cloistered nuns still live nearly 400 years later. Cervantes owed his life to these nuns. You see, before Cervantes wrote "Don Quixote," he had some chivalrous adventures of his own. He fled Spain after a dual. He came back and enlisted in the Spanish navy. He went to war to defend the pope. He got shot in the ribs and arm, and then he got kidnapped by Algerian pirates. FERNANDO DEL PRADO: He was taken prisoner. He spent five years - five terrible years - as a slave, as a captive. FRAYER: Historian Fernando Del Prado says the Trinitarian nuns delivered a ransom to the pirates and got Cervantes freed. It's like something straight out of "Don Quixote." And now for the past year and a half, Madrid has been on a quixotic mission of its own to find Cervantes' bones under this convent and finally mark the burial site. In an underground crypt, geophysicist Luis Avial used geo-radar to X-ray long-forgotten burial chambers. FRAYER: All the contours of centuries-old graves became clear. Next, they began digging and found 15 sets of human remains, one of them in a wooden coffin marked with the initials M.C. The skeleton's ribs were flayed, its left arm crippled. Good enough proof, says forensic anthropologist Francisco Etxeberria, that they'd found their man. FRAYER: "When I saw that rib, I thought we found Cervantes at last," he said. It was a special moment. The whole team was there. This month, Exteberria's team reburied Cervantes' bones near where they found them, adhering to his dying wish, and dedicated a monument to him upstairs in the convent. The Honor guard was from the same Spanish military unit Cervantes himself once served in. FRAYER: It's finally time to say Don Miguel, mission accomplished," outgoing Mayor Ana Botella said four centuries late. Madrid is negotiating with the Trinitarian nuns over new visiting hours. For now, tourists can pay homage to Cervantes only during mass times. For NPR News, I'm Lauren Frayer in Madrid. BRIAN STOKES MITCHELL: (As Don Quixote) (Singing) I am I, Don Quixote, the Lord of La Mancha. My destiny calls, and I go. And the wild winds of fortune will carry me onward, oh whithersoever they blow. Whithersoever they blow, onward to glory I go. Transcript provided by NPR, Copyright NPR.